Information about Droxy’s other crafting creations, as well as links to more of her work, check out her profile in the Harry Potter Crafts Section of Leaky. 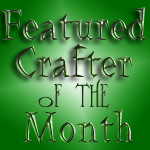 On a related note, nominations are now being accepted through the 15th of October for November’s Featured Crafter of the Month. To submit a crafter who you would like to see be featured next month, simply email [email protected] with the crafters name, as well as links to their work. Full details about the nomination process can be found via this link.